Some movie storylines just don’t stand the test of time. Take for example the scene from the 1979 movie titled The Jerk, where Navin R. Johnson is elated to discover his name is on pg. 73 of the phone book, declaring, “Things are gonna start happening to me now!” There was a time when a phone book entry signaled a coming of age, where getting a land line in your name equaled a rite of passage. That time has passed. If you’re a telephone book sales rep, let me just say: I apologize. This is going to hurt. I’m speaking of the plummeting relevance of any printed telephone book, white pages or yellow pages as a marketing tool. In the past year I’ve had questions from three clients, somewhat apologetically, asking about the benefit of the paid “yellow pages” display advertising that for so long put them on the consumer map, driving foot traffic and phone calls. “Does this really gain me anything?” No. No, it does not. Evidence has been stacking up against these perfect bound relics for years. 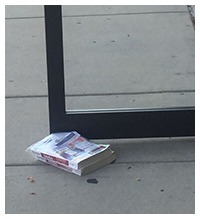 Show of reader hands: When was the last time you looked at a phone book? I’m noticing that most of the books delivered to me are now the mini-books, presumably for the trunk of our car. As evidenced by the photo, many don’t make it out of the shrink wrap. With the evolution of media and revolution of social media, phone numbers are no longer the primary mode of communication. A growing 44% of consumers have given up their land lines according to this GFK media survey. If I need someone’s phone number, I can usually follow the online breadcrumbs. Consumers of all ages are letting their fingers do the walking…on their iPhone, iPad or Android. They’re using Google and other search engines to look up addresses, phone numbers and websites, where the majority of consumer and B2B buying begins. And remember when there was only one Yellow Pages? Today there are multiple books that compete and you must buy ads in several publications. In the end, it is Google Business and a number of other online directories that dictate whether consumers can find you. You may use it to prop open a door, or as a makeshift booster chair. You may even stash one under the car seat just for back-up. With the continuing emergence of digital, internet and broadcast media, it simply cannot stack up to the results delivered by the digital age.